I wanted to come to you this week with word that we are definitely a step closer to “owning” the house. But it’s Thursday already and I can’t wait any longer to post and update you kind people. Prematurely the other day, I announced to friends and family that we have the house. The problem is that the listing agent was rather slow to get it in writing from the sellers. That agent was to have the paperwork to our agent’s office over the weekend. Then there was Presidents’ Day Monday, Greg stayed home to keep an eye on my health (that will be explained soon), so we didn’t expect word on our first home purchase until the following day. Tuesday came, Wednesday went by and now we’re on Thursday finally with the paperwork. The next step is to have the seller’s bank approve the offer….we’re told this could take a month. Deep breath. Then we have 45 days or more for the house and paperwork to be approved for our particular loan type. More deep breathing. Since I'm sharing my craigslist find below, I'll show you this other $40 find. 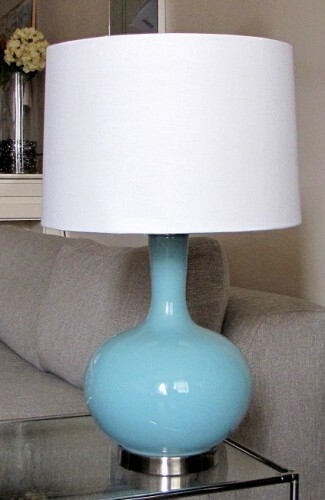 Love the gourd shape and pop of color in my neutral room. That brings me to the issue of my health. I woke up early Sunday morning with heart palpitations-a feeling that my heart was racing and pulsing in my neck and throat. At that time, it wasn’t racing at all. I felt panicked. Heart palpitation symptoms matched my experience but panic attack explained the feeling. No amount of deep breathing helped at that time. It lasted all day Sunday and was pretty scary. I’ve never experienced that and I’m a lifetime worrier. To be honest, I’ve had more stressful times in my past than now. Greg has had a positive influence on me with his “so what” attitude. I think it comes down to my reduction and elimination of diet pop. It’s my downfall. I gave it up briefly years ago just to come back so I believe it was part caffeine withdrawal and stress. (I’m still having caffeine though so I’m confused a bit.) I still experience bouts of palpitations and panic but deep breathing is helping. I’m not experiencing pain or dizziness. I’m still hungry-starving actually. The day I’m not hungry is the day pigs fly out of my arse. Relaxation and deep breathing has been my coping mechanism and plan for the future. I know this is a rather long post but I wanted to share my craigslist find before the recipe. While this week sounds confusing, it’s been a good one. 2011 has been fairly happy thus far for Greg and I. 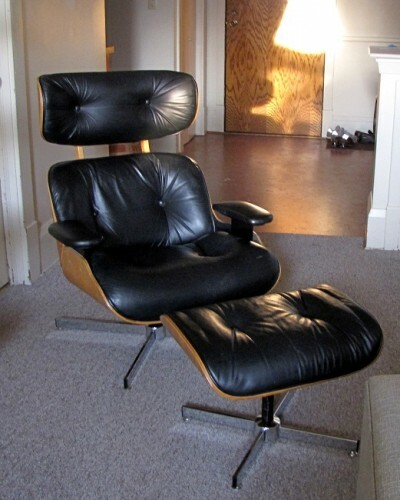 Finding out that we are a step closer to our first home and finding the chair pictured below (a replica Eames lounge chair) on craigslist for $300 on Tuesday had us over the moon. We drove 45 minutes to get it that night from a nice, retired couple (also mid century furniture fans) who bought the chair at an Arizona estate sale. The price is about a third of what you would pay retail and the lowest asking price for this piece we’ve ever seen, even being a replica. You just can’t pass this up being a fan of that furniture era. I’m on the lookout for an arco lamp but that craigslist deal hasn’t come up yet. Typing this, I pause to look at the chair because I still can’t believe it’s ours. The 2010 Annie would have said good things don’t happen to me so what’s the catch but 2011 me thinks things are going to be just dandy. 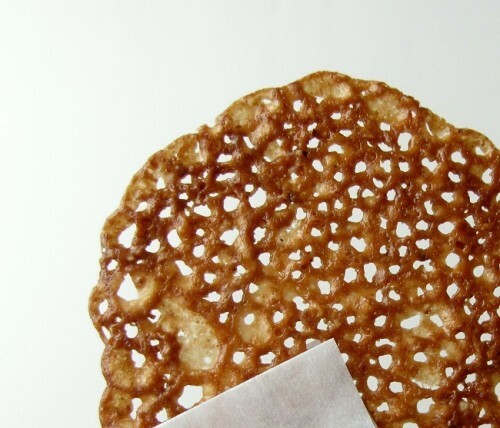 As dandy as these lace cookies, some call them Florentines. I’m not familiar with either but have become their enthusiast. They look difficult to prepare but it’s embarrassing how easy they are and how few ingredients they require. Delicate with caramel-pecan flavor, I give you the lace cookie from Real Simple. *I’ve had some requests for pictures of the house and such but will probably wait until we are further along in the process. Don’t worry, I will probably give you too many, to the point of you saying enough. Enough already, Annie! Preheat the oven to 350F. Pulse the almonds in a food processor or place the almonds in a plastic baggie and smash them to tiny bits with the back of a spoon. That’s good to relieve stress and fun too. 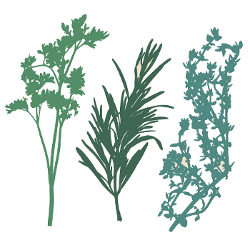 Set aside and place parchment paper on a baking sheet. In a small saucepan, combine the butter, sugars and cream. Bring to a boil, stirring until the sugars dissolve, about a minute. Remove from the heat and stir in the chopped pecans, flour and salt. Working quickly, drop a teaspoon of the batter, 4 inches apart, on the parchment-lined baking sheet. They spread out so making 4 or so at a time is advised or you’ll have one giant sheet of lace cookies. You’ll be doing these in batches so warm the batter on low on the stovetop before dropping them onto the sheet. My advice would be to have two sheets prepared but bake only one sheet at a time so that the cooling process doesn’t become bothersome. Bake, rotating the sheet halfway through, for 8 to 10 minutes or until golden brown. These burn easily so keep an eye on them. I admit though that some of the darker ones were my favorite. Cool on the sheet until firm, about 5 minutes and then transfer to wire racks to completely cool. I love the lace look! Very pretty (and tasty, too, I’m sure). These are some gorgeous cookies and all it takes is dropping them on the sheet and they do the work. Thanks, Kristin! Don’t you love craiglist? There is so much I want to say tonight….I know how scary those anxiety attacks can be. I had heart palpitations and anxiety attacks for years, and I still get them occasionally. We are both so lucky to have such great men in our lives. I am praying that you feel peace throughout the weekend and into next week. The house is so exciting, but i know it brings a lot of worries/stress. Whatever is meant to be will be! Thanks for sharing, sweet lady. I hope you have a splendid weekend full of sleep, laughter and love! I do hope the panic attack stuff doesn’t reoccur. It does help to have someone around that doesn’t get worked up about most things (my husband is like that, too). Also, I have a favorite recipe that includes almond lace cookies (very similar) with drizzled chocolate. Then you stack them (napolean style) with whipped cream and berries in between. It’s really festive looking, but not that hard.